Apulia (Puglia) is a region in Southern Italy bordering the Adriatic Sea in the east, the Ionian Sea to the southeast, and the Strait of Òtranto and Gulf of Taranto in the south. 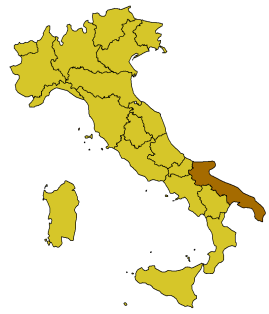 Its southernmost portion, known as Salento peninsula, forms a high heel on the “boot” of Italy. Its capital city is Bari. Other major cities include Foggia, Brindisi, Tananto, Lecce..
Puglia has beautiful sun-bleached landscapes, silver olive groves, picturesque seascapes, and memorable hilltop and coastal towns. It is a largely flat farming region, with a long coast that alternates between glittering limestone precipices and long sandy beaches. The heel of Italy juts into the Adriatic and Ionian Seas and the waters of both are between translucent emerald-green and dusky powder blue. Not to miss is the coast of Gargano that houses numerous beaches and tourist facilities, including resorts such a ViestePeschici and Mattinata. The Salento peninsula is a rock of limestone dividing the Adriatic Sea from the Ionian Sea. Known also as “peninsula salentina”. A must to visit is Ostuni where you can admire the Trulli the traditional Apuliandry stone huts . Apulia’s 800 kilometers (497 mi) of coastline is studded with ports, which make this region an important terminal for transport and tourism to Greece and the eastern Mediterranean. Having warm and sunny weather most of the year and being surrounded by the sea, Puglia has traditionally been a region with excellent production in terms of wines, extra virgin olive oil, fruit, vegetables, wheat, and seafood. The nearest international airports are those of Brindisi and Bari. A 2-lane freeway connects Salento to Bari. The main railway line ends at Lecce. Other locations are served by regional railroads.